The Miliband scrap has finally been settled and the red in the bed is Ed, not David wow seems the housewives favourite couldn’t swing the popularity meter all the way to the final. A few weeks ago the five hopefuls all showed up on question time. As the debate got underway it soon became clear that each of the five stars were all intent on playing to the audience and they all showed a severe lack of an ability to communicate with each other and had at times to be gently nudged by the Devils Advocate (David Dimbleby) or just drawn out on the questions as well as having to have some of the issues outlined again as they all sought to deflect the question into a political platform for their own agendas. We have come a long way since then now that the siblings have fallen back into the natural family support, united front against the world stance with David rallying support for his deserved brothers win. Well this useless government is at it again, kicking the foundations when there is a subsidence order in place, don’t you just love idiots and morons as they clash, crash and seek to burn the last vestiges of the human colony from the third rock, all in the name of control, all to set their seal on things. The unemployed are being targeted yet again, after all, all new industries come out of the ranks of the downtrodden, all new industrial innovations come out of the no money, no resources ranks of the browbeaten level of the workforce. The intent seems to be to use the unemployed as a social buffer to care for the community, elderly, infirm, children. Not to mention restoration work and the upkeep of urban areas and inner city focal points. The thing is they will have to use coercion to achieve this, they have to smash the civil rights and civil liberties of the people, unless they intend to make an elite strata for the working plebs and a sub structure of limited rights for the new slave class the unemployed and the incapable. Ah and just when we need a new socialist red hand to steer the tiller into the precipice falls of the crashing rocks of the still crashing recession up pops Ed the Red, isn’t life amazing in its timing. Governments, and the industrial sectors as well as the capitalist structure of the old world (pre recession) are the ones that will not take responsibility for the mess that they have made, while they are all intent on making life hell at the bottom, can’t let hades hothouse suddenly become a paradise for the weak and infirm or the idle now can they. The unemployed have never been the saviours of the day, the rank and file that have to take the hand out, are not know for great innovations, being more inventive than just getting by and of course without any savings or resources they have never turned around a government fiasco like this anytime in history ever, so be warned the fact that they are trying to fast track legislative changes to repeal laws and institute changes that damage civil rights and civil liberties is a cause for worry, after all no one voted for a coalition it was foisted on us to keep these wasters and selfish users in at the trough. The reason it takes so long to make legislative changes is that every new direction will throw up unexpected or unforeseen emergencies and be prone to repercussions so time needs to be used to safeguard the central structure and its collective integrity at all levels of society. The kind of unforeseen events like sub primes and the repercussions from them, the effect of floods and droughts on rice and wheat production and how shifts in weather patterns will affect crop yields. None of these have been well modelled and climate still has the collective best educated and informed minds of the present system stumped and that has allowed two camps to form and so we now have an artificially entrenched siege of the scientific young Turks as they lay siege to the naturalist plea that it’s all been figure fixing and facts fudging that has come out of both ranks as they seek to get the upper hand. This mud-slinging and facts rigging is clouding the waters and obscuring the facts. Now we all know that we don’t need a war of ideologies, and having two sets encamped will only bring out the rubber neck mod to watch the line up to see what will happen next. We on the other hand all know that we need the facts (proven) the probable outcome of them and a formative solution for a better way forward for us all. The facts about the actual numbers of the work force is, that a massive amount of workers are actually on the sick and are ducking and diving, there are quite a high percentage that are in positions that are really redundant and some ‘sickies’ are just hiding their hidden redundancy behind a sick note. According to the Daily Telegraph a hundred billion pounds is wasted every year by the migrant and the long-term sick. The fact that no growth sector has been found in the world industry catalogue of careers and vocations for the last ten or more years excepting all the boom and bust fiascos of the last decade. It quickly becomes apparent that with an aging population, a growing idle workforce and the nature of man to get destructive when idle or socially made to feel inadequate or ostracised from their peers. The innovation of larger numbers of people who cannot earn a living and larger numbers needing care and support, is a growing need that must be filled by the growing unemployed ranks, with no growth sectors and greater money black holes appearing in the fiscal level of the capitalist structure, how do you get all the unemployed to care for the elderly and infirm without being able to pay them………..hmmmmmmm. Cant see how that could happen can you? So every idiot that is fearful for their own job, that thinks that the unemployed should be forced to do it for no pay, will drive a wedge in this country with greater damage that the idiots have managed with their already failed measures to make a system that has never delivered look like it has a chance, while the idiots that pick on the unemployed will just be putting a gun to their own heads in a few years time when more and more of them join the ranks of the unfortunate. They will be subject to the enforcement they think is alright, in a democracy, no being can be coerced against their will, making people take jobs will only produce a more belligerent workforce than the one that is falling down by the wayside of the last pilgrimage of the new age prosperity wild goose trail. A dictator can force his people to do what he wants just ask Mugabe, but a democracy that uses the vote as a proxy for the elected to work on our collective behalf, that just isn’t allowed under the terms of the statement that Britain is still a democracy until the will of the people says otherwise. The basic concept for using a medium to divine goes way back to the shamanistic practice of reading the entrails or interpreting sign. The fact that the reader must have some perceptive insight working before the medium was found has been underplayed by the mainstream users of the adopted systems, Tarot, Rune, Tea Leaves, Palms and crystal balls to mention most of the mainstream favourites. The original shamanists that used their ability for the group did make a point of not being tied to a particular system, knowing that they would have to initiate their spontaneous reasoning faculty to affect the insight from anything that might reflect the macrocosms take on the microcosms event. So instigating the inspirational system would be a must and so the reliance on a specific system would be seen as a limiting of the faculty. Rather than teach any potential acolyte, that’s someone showing the talents and displaying an interest in the mysteries. Teach them the creative spontaneity of divining the moment. Rather than guessing the outcome through a complex medium. Read the moment, its mood, attitude and its intentions to keep the eye on the ball. A sort of forensic eye on the probable outcomes and lay a course for the outcome of your choice. Or the edge of your perceptions from insights highest point. When the acolyte can make accurate predictions in a regular fashion then advancement is achieved. After a while the faculty can exceed any mere medium. The five elements that have to be taken into account are the nature of the trap, because vision is so beguiling it makes us all focus on the external image of the moment, but when we internalise our concentration then the inner senses start to relay information, no not true that is when we first become aware of something that is already happening inside us, it is just brought into our inner perceptions focus of consciousness. The acolyte will sense impressions, feelings, time and probable actions. With the eyes closed the collective consciousness will relay impressions to the focus of the locus, the concentration of mind, body, emotions and spirit that go to make up the locus of being. Reading fortunes is a fairground attraction and is just the right level of expected platitudes for the pence. Develop the faculty, practice in the moment and learn to know, then know well ahead and that should take care of the predictive illusion in a single sentence. Just keep practicing and just guess to begin with and work out your odds to see how many punters you can fool before they see through you. For all those that actually have the talent you should have the wisdom to believe in yourself and have the faith to know the certainty in the read. And of course the last but not the least by a long chalk the passion will ignite the power and release the inner phoenix of transformation. The Tarot is one of the most controversial divination tools on the market today, its origins are a mystery, the trail stops in the mists of time. Various schools of thought have tried to follow the logic trail to the recorded source event or era where they first appeared. The evidence is conflicting and fragmented; this is probably because it was from the scattered remains from a previous civilisation. The fact that the minor arcana is an almanac that maps the weeks of the year, has four ‘jokers’ (season cards?) has thirteen weeks in each season, is the highest likelihood for the true origins of the minor arcana as discussed in the last article. The Major Arcana has more of a mystery to it than just being thought of as the book of Thoth, it is the greatest mystery yet, it has direct links and parallels with the ancient Hebrew alphabet. Twenty two characters, some arguments that the Tarot cards are the pictorial references for an oral language that was taught by rote, some say that the cards are that old and others say that they have a root directly back to ancient Egypt and the book of Thoth. The speculation is endless and the camps are entrenched and all sides stipulate that they have the correct take on the whole thing, that in the best tradition of fate will have to wait till the jury is in and the evidence trail is better established. One of the areas that are still being looked at in particular quarters is the layout as seen below. This image is laid out from left to right and from base to top in a sequential order. This is a fairly old-established way of looking at the whole book. This is essentially the story of the prodigal son, the errant lad hones his skills on the prime level, the instinct of all nature is tied at this level, this includes all of the kingdoms of creation and not just the scientific segregationist observer’s tables and formulas apply here. The first layer has the skills level of the instinctive nature that is both, learned and instructed as its base. The second level is the area of learned experience, strength flows from applying the self with diligence, overcoming adversity, standing your ground etc. Temperance is the result of applied wisdom, the maxim ‘moderation in everything’ springs to mind. All of this level of Intuitive restraint must be learned without killing the life, the will, the faith and the passion. Some established readings of the layouts are from base to top, select a base card, we will take the magician, strength and the devil. This is most often seen like this. The magician is learning and balancing his skills as his power grows it takes great strength of character to restrain the impetus to squander the power and without the restraint of strength the magician becomes the demon. Take the Priestess, the Hermit and the Tower, secular wisdom that is too secularised will become a decaying empire. The seven chakras are said to represent either seven traumas or rights of passage for the individual, when the crown chakra was at the height of the full body chakra. When a child is born an infant can be up to two feet long from head to toe and this would place the crown chakra at the same level as the base chakra. Now the most formative experience from the time it takes to grow up enough so that the crown chakra is in still less than the area of the naval chakra and more than the base chakra in height when set against the full adult chakras is the seven ages of the lifespan of the being. The seven formative experiences of the being are concentric in the region of the chakras as they are traditionally seen. The quick route to clearing the trapped negative energy, will require a catharsis from the age that it was formulated at. The negative or traumatic process will have formulated an energy process that is more negative and therefore causes recessions, arrested developments and recessive emotional issues. The little woman shows the birth size of an average size eight to ten pound infant size. 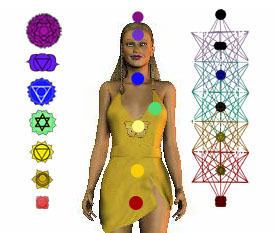 The crown chakra is level with the base chakra on the full-grown woman as the numeric reference shows. 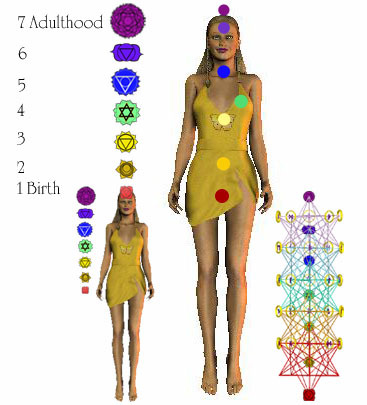 As the ‘child’ grows the crown chakra will travel up the height of the body to view the world from each of the chakras at their eventual position in life. Traumas are the worst that have to be dealt with, but even a good formation and experience between two negative ones is diminished because of the negative recessive nature of inhibited flow. As beings we all experience hopes as well as fears, so even a relatively less complex person will still have to consider the universal equation, take your greatest hopes and then take your worst fears from them and whatever is leftover is all that you will manifest and be able to realise. The alternative to dealing with the traumas of the chakras is to find the grains of truth that are the grain in the pearls of wisdom. Glean all the wisdom of the perceptive insight from the realisation process and you begin to see the level of work involved. The time that it takes is incalculable as every being is different. To clear the blockages and unrestraint the flow of energy that is negatively trapped, is a much simpler process and is more advisable to the seeker than the formulation of the stone from the collective grains of truth. 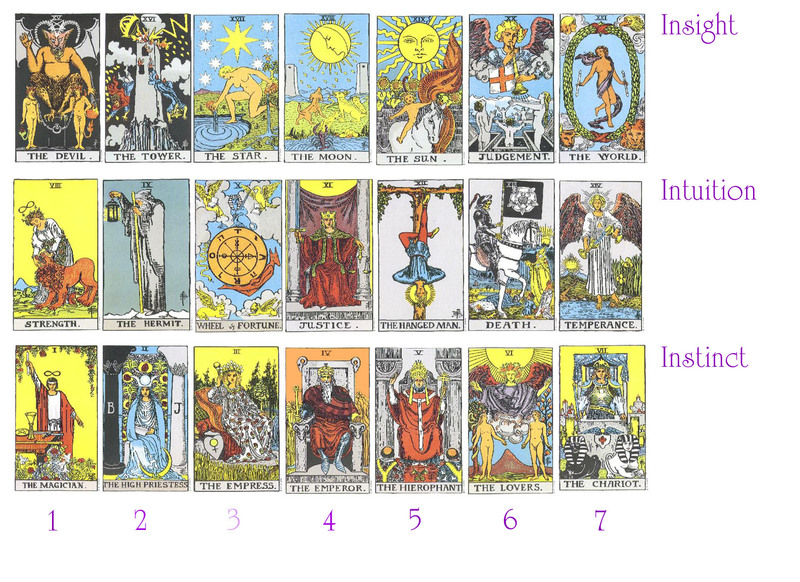 This is the template for understanding the layout of the Major Arcana as shown in the first image. The key to understanding the layout of the Major Arcana without being sucked into the book of Thoth is to use the instinctive, intuitional and Insight mapping and see how they reflect your personal traumas, or formative experiences. The top row shows the devil to the world, this is a basic Christian hang up about the material world and all its corruptions, hence the Devil. A better understanding of this point is better achieved by viewing this as the conscious being nailed to the cross of the four elements, in this case the pyramid is a reasonable representation for the birth process, a new consciousness held in the binds of the four elements. The Chakra and Rune tree at the bottom right of the last image shows five senses and seven chakras. 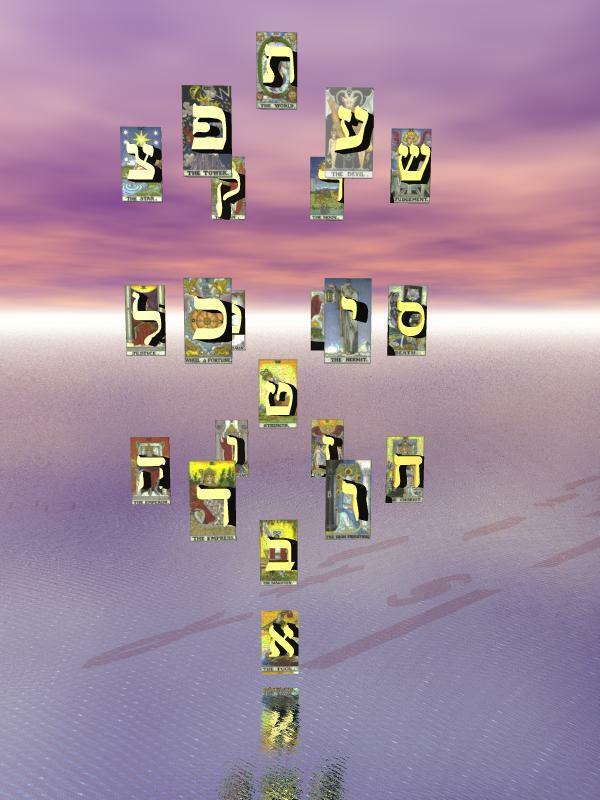 This is the final tree in the Kabbalah lineage. If we look at the magician, strength and the devil, a trauma related to this development area can have a very bad outcome for the being involved. A misuse of powers or skills employed by the weakness of character will result in a hellish outcome, or a trauma, an emotional blockage an energy drain. If the person has the good skill set, and develops a good strength of character, the hellish ending is averted and a clearing of the chakra is the result. This is true for all of the formative ages in the growth from childhood to adulthood for every being. The layout of the Tarot can be used as a contemplation device for helping the search for the blocked chakras, do not ask anyone’s help, do not seek advice, even a good guru cannot help you any better than your own self-knowledge. You are after all the greatest living expert there is on you, no one knows better what’s right for you, or what you must do. A guru can highlight the general areas and give very general advice, but only you walk the road, only one being can access the information or reflect on the experience to be reviewed. I hope that this proves helpful and that you can see that no area that has previously been secular and separated in the mysteries can now in the light of the new age wisdom, remain disconnected to the source of all understanding and wisdom. All the paths again converge and lead to the ultimate revelation of insights wisdom.